Simplify your relationship and lead management. Leads and key relationships can be difficult to manage when they’re scattered across different platforms. 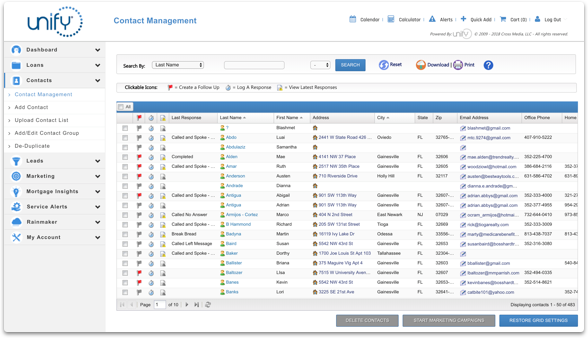 The Unify Contact Management solution makes it easy. Manage all your contacts in one place in just a few clicks. Relationships are hard to nurture. Unify can make it look easy. We understand how important referral partners, contacts, and leads are to your business. You not only need to develop them, you need to nurture them. But to nurture them, you need to track them and send the right message at the right time. Unify helps you do all of this with ease to create more lending opportunities for your business. Mortgage contact management made easy. 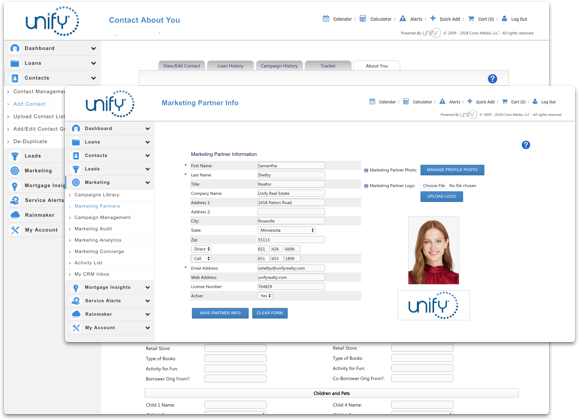 With Unify, important information about your customers is only a click away. Our contact management solution built just for mortgage leaders helps you get the most out of your key contacts. Access borrowers’ past loan transactions with you, view your marketing history, or start contacts on new marketing communications in minutes. You can also manage contact groups and leverage our easy-to-use tools to keep your database clean and current. We understand how important leads are to your mortgage business. That’s why we built the Unify lead management solution specifically for your unique demands. Unify pulls data from multiple sources and automatically organizes it to give you the key information you need to nurture leads more effectively. Measure results, set follow-up tasks, or initiate communications in just a few clicks. Easily set up appointments or tasks for specific contacts, set your reminders, and sync them to your Outlook Calendar. Easily maintain and manage all of your contacts and their key information in one place. Target your marketing more efficiently by creating custom contact groups. Close the deal by delivering the right message to the right group of people at the right time. Easily add your contacts or leads from any Excel file. Get access to relevant customer history to nurture valuable relationships with important customers. Automatically syncs new borrowers and co-borrowers to your contacts in Unify eliminating the inefficiencies of double entry. Capture important information from motivated borrowers and future customers with our lead integration software that accepts leads from third-party sources and web forms. Our Catapult option for lead distribution rings the phone of every loan originator currently set up to receive leads. Simply accept the call and the lead is assigned. Know where your leads are coming from, track performace, and gain insight into your most valuable leads. How does Unify help originators in the top 1%? James cosistently ranks in the top 1% of originators nationwide and is approaching $2 Billion in career production. His hands-on approach in mortgage lending has helped contribute to his record of 99% approvals. James’ impeccable reputation and attention to detail keeps customers coming back time and time again.